Lab Supply is proud to provide a number of great laboratory diets for guinea pigs from LabDiet. LabDiet is highly trusted among many animal facilities and it is definitely a brand that you can trust in your lab. Guinea Pig Diet 5025 is formulated to help guinea pigs maintain levels of growth and reproduction. This great guinea pig diet is designed to be used at all life-stages and is nutritionally complete. Since this diet is nutritionally complete, it requires no extra supplementation or treats. This guinea pig diet is made from the highest quality ingredients and is formulated to help prevent still births. This product also contains stabilized vitamin C, which lasts longer than regular vitamin C. If you are interested in learning more about this great guinea pig diet, then please click here to view the product PDF. Here at Lab Supply, we are committed to making sure you find exactly what you are looking for. 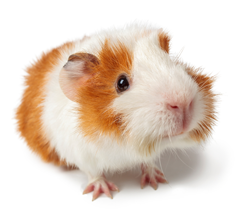 If you have any questions about the guinea pig feeds that we offer in our store, then please click here to visit our contact page. We will be more than happy to answer any questions you may have.